Fourth Row Center: Film Writings by Jason Bailey: In Theaters: "Old Partner"
You wouldn’t think that a documentary portrait of an elderly Korean farming couple and their dying ox is the kind of thing that would suffer by comparison; indeed, you wouldn’t imagine that there’s much of anything else in the world to compare it to. But as luck would have it, I saw said documentary, Old Partner, less than a week after taking in a documentary about sheep herders rustling a herd across Montana. Neither one sounds like anything you’d want to sit through, and admittedly, the shepherd doc is the stronger picture. But they’re both a hell of a lot more interesting than they sound. But it is. The animal is getting sicker, less able to do the demanding work, and if Choi can’t admit it, Yi surely can. She ends up picking up much of the slack, and fumes over her husband’s dedication to the beast (“Day and in and day out, all he knows is that ox”). Their relationship is amusingly snippy, and though it’s funny, it’s also rather tragic. Yi never enjoys the attention or affection he pays to their ox, and she’s not quiet about it—in fact, she compares herself to the animal, and does it bluntly. That relationship is probably the film’s primary focus, and it is fascinating, though their bickering and general malaise grows somewhat wearying by the picture’s end. It is also a somewhat heartbreaking portrait of this worn-out old man; there is an almost uncomfortably intimate scene that catches Choi lying on the floor of his living room, just trying to breathe, and his guttural moan is startling. This is not a man who should still be hand-plowing fields and planting in the patties. But he is a stubborn, difficult old guy, as seen in the scene where he resists selling an unmanageable calf. If the subject is surprisingly compelling, the execution is a bit spotty; even at a brisk 78 minutes, the film drags a bit, and the piano score, though occasionally effective, is transparently cheap and manipulative. The videography is blotchy and full, though some of the framings are inventive (there’s a particularly good shots late in the film of the two old souls lumbering down the road). Old Partner’s ending breaks your heart a little; throughout the film, the old ox’s presence is announced by the elegant ringing of his little bell, and the film is framed by old Choi and that bell. 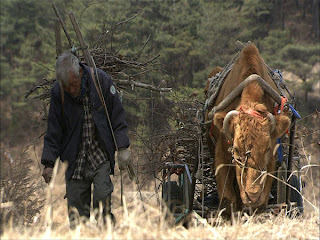 It’s moving—more moving, really, than a documentary about an ox has any right to be. There’s a pretty narrow niche audience for this kind of movie, and if you’re not in it, nothing I can write will convince you to check this one out. But some viewers will be drawn right in by it, and you know who you are. "Old Partner" opens in New York City on Wednesday, December 30th. In Theaters: "The White Ribbon"
In Theaters: "The Loss of a Teardrop Diamond"